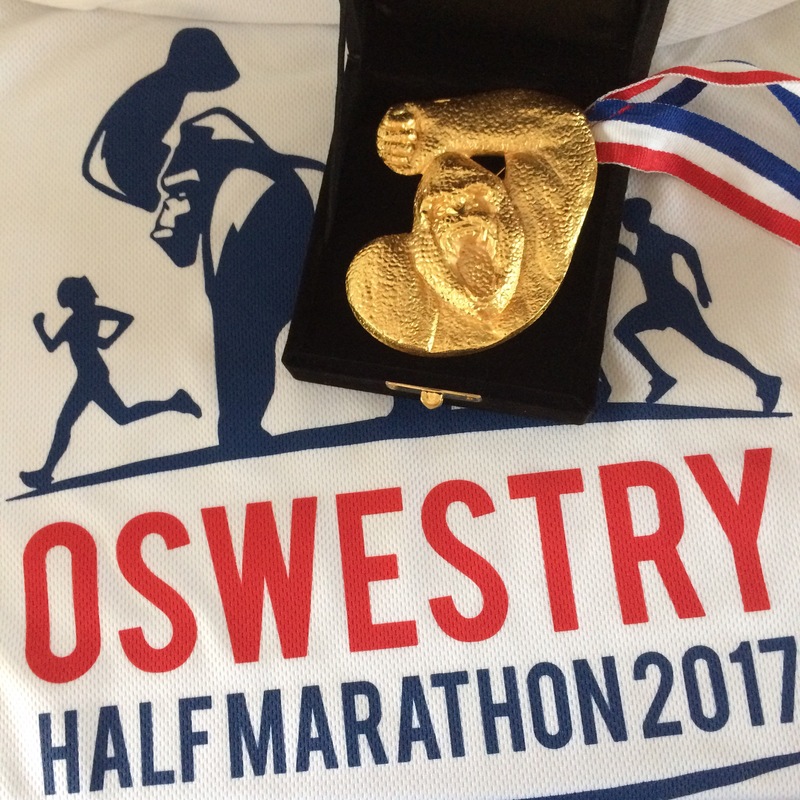 I was excited about the Oswestry Half, because it’s always nice to be able to run an inaugural event. It was also the half marathon I was working towards with Celia, who I had been coaching towards her first ever half marathon, after we ran her first 10k event in September. This race wasn’t about a PB for me, because I had planned to run it with Celia, providing her support, so I can’t comment on its suitability as a PB course; however, apart from the short section across grass and stones, the course was all on flat roads, with one short, insignificant hill between mile 6 and 7. However, let’s rewind to earlier in the morning. The race was based at the British Ironwork Centre, just outside Oswestry. It was easy to find, just off the A5, and there was a marshall directing traffic into the centre. We parked on a well-marshalled field, and within minutes I was in the race village where I could see a well organised registration tent (I checked my number on the board, and had collected my number within seconds), a tent filled with around 20 physios providing pre-race massages, a baggage tent, a pop up cafe, vans selling pizza and crepes (I made a mental note to visit them after the race), some trade stands, plenty of seating, plus a stage with the trophies and medals on, and around 30 portaloos which were clean and well stocked with loo roll and alcohol gel. It was just after 8am, with the race due to start at 9:30am, so with none of the anticipated queues, I had over an hour to spare, so I found Celia, and we sat down and had a cup of tea while we chatted about how training had gone, and our strategy and expectations for the race ahead. A very nice, relaxed start to the race. 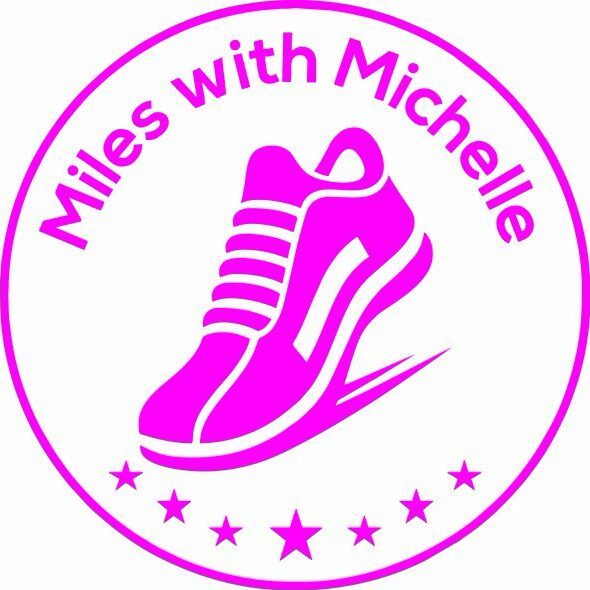 Just after 9am, the announcer advised that Amy Hughes (@53marathons) would be doing the warm up at the stage, so we headed over there and did some cardio and some lunges to warm our muscles up a little, then we headed over to the start area. There was a brass band playing, which was a lovely touch, and I spotted tailrunner Matt (@mattupston) then Mike (@ParkgateRunner) came over to say hello who I had been tweeting earlier in the morning. Then there was a countdown from 10, the cannon fired (yes really!) and we were over the start line within a minute. There were 1000 runners at this inaugural event, so I knew we would have plenty of space to run in, but I also suspected we may find some parts of the course lonely as the field naturally spread out, so I was glad I was running with Celia to help her along. The first section was over a couple of fields to get out onto the lane behind the centre; the footing was a little uneven, and stony in places, so it was a relief to find the road under our feet so Celia could settle comfortably into her pace. My job today was keeping her company, making sure she was taking on adequate nutrition, and keeping her motivated in those final stages. The first 4 miles were on quiet country lanes, and we would repeat these miles later in the opposite direction, after a loop of the town centre. Out of the country lanes, we headed into a housing estate where there was great support from the residents, and plenty of sweets on offer. We then headed into the town centre itself, where drivers were already getting impatient waiting for runners, and were sadly ignoring a lot of the marshalls, and driving around cones placed in the road. We ran on pavements a lot of the way through the town centre, as a few drivers were being very impatient, and the fact that the field was spread out at this point I think meant that marshalls couldn’t enforce road closures as well as they could with an obvious stream of runners. That said, they did a fantastic job of keeping us safe and I think the marshalls enforcing road closures always have the toughest job on a race as many people do get angry behind a wheel nowadays! Onto the hill just after mile 6. It wasn’t too bad actually, it started gently inclining out of town, then got a bit steeper towards the top, then we turned into a housing estate for the final climb (with some great ladies cheering us on to the top), then we were downhill again, back into town to begin heading back. All along the route, we had been spotting the unique mile markers along the way, so it was really nice to be able to see them from quite a way off. Eventually we found ourselves back on the road we had been on earlier at 9 miles and I breathed a sigh of relief at being away from the bustle of the town centre and back onto the quiet lanes. There was a brief out and back just after mile 11, to make the race distance up to half marathon, then we had a nice straight road back, which just left the two fields to cross. We could see the finish from over half a mile away, and it was slightly uphill on grass to reach the actual line, but there was still plenty of support and cheering as we ran those final hundred yards or so. We each got an individual printout of our race results, then headed over to the race village to collect our goody bags, T-shirt (sadly only large size left by this point), and then the medals took a little bit of finding. The marshal at the goody bags had pointed us over to near the stage, where there was currently a presentation happening to the overall and age category winners, so the area was crowded with people and it wasn’t obvious where the medals where. In the end, I asked somebody wearing a medal where we collected them from, and she pointed to a little white iron gazebo, in front of which was standing a lady, rather inconspicuously. 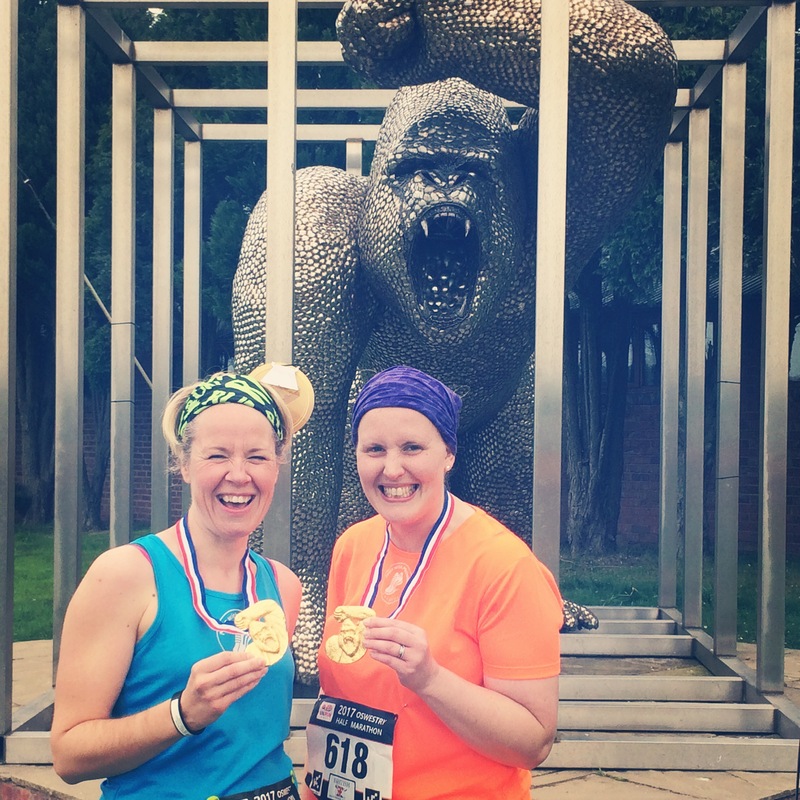 She handed us each a black box, and I have to say, we each uttered a “Wow” when we opened them to see a bright shiny gorilla shaped medal resting inside. I had seen pictures of the medal, but it was more stunning than I had imagined, and I am really not a ‘bling person’ – I’ll run a race for a cup of tea and a bowl of soup (see Grindleford Gallop blog) rather than a medal, but this will hang proudly on my medal hanger. It is special. After the race, we ate guilt-free pizza and I had a quick wander around the British Ironwork Centre, which is an unusual and unique place, well worth a visit (also free entry), then I headed home to show off my new bling. All in all, a great first event . The only feedback I would give to change for next year would be to hand out medals immediately as runners finish, because that’s often the main reason people sign up to an event in the first place, so make that really special. EDIT: I’ve since heard that many runners received their medals up on stage, personally presented by the town mayor. A lovely personal touch, but it seems we arrived too late to be presented with our medals this way, which is a shame. The free photos are also fantastic quality – I had over 50 free images of myself taken and tagged. Overall, a great friendly-feeling event, well-marshalled, and no obvious issues. 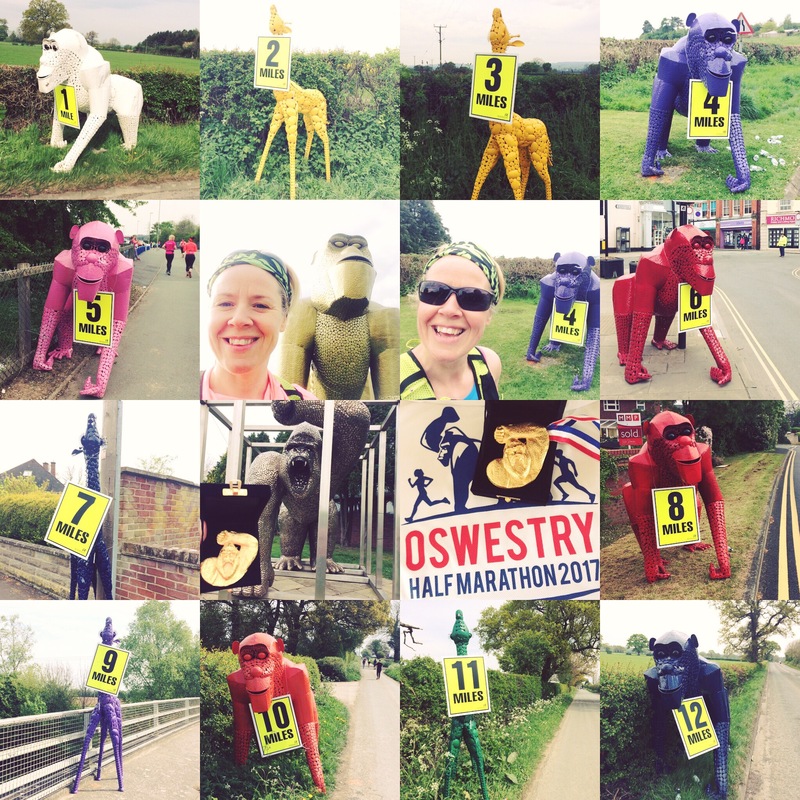 Thank you to UKRunChat for the opportunity to run the first ever Oswestry Half. Oh my gosh I love those mile markers! And the medal. Looks like a great event to be a part of! Really unique I thought! Enjoyed it.